The Wake Forest University School of Business ranks No. 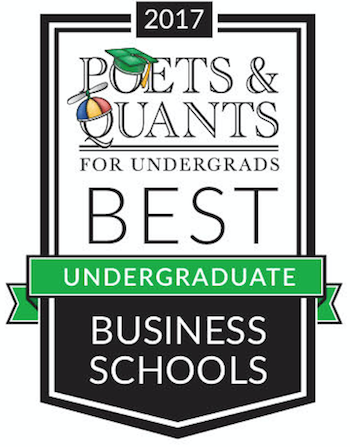 15 among the nation’s top business programs in Poets & Quants’ recently released ranking of the Best Undergraduate Business Programs in 2017. According to the publication, the ranking was determined through three equally weighted categories: admissions standards that measure the quality of the incoming students, alumni perspective on their educational experience, and employment data which includes internships, employment within three months of graduation and salary. Nationally, the School was ranked at No. 3 in quality of teaching, No. 5 for internships with 98 percent of our undergraduates securing at least one, and No. 13 in preparation for the real world, achieving accolades for these academic markers. “Our results are a testament to the hard work that our faculty and staff have invested in helping our students gain the knowledge and skills necessary to be effective day one post-graduation and excel early in their careers,” said Pat Dickson, associate dean for the undergraduate business program at Wake Forest. When it comes to their student experiences, Wake Forest alumni gave the School high marks. Their answers to the survey put the School at No. 10 for alumni accessibility. Would they recommend Wake Forest to a close friend? The affirmative answers put the School at No. 10 nationally. “We are truly gratified that our Wake Forest alumni continue to hold in such high regard their educational and networking experiences during their time in our School, and for the ongoing impact it has on their careers,” said Gordon McCray, vice dean of academic programs. The publication names business degrees as the most popular undergraduate degree granted in the United States. For more information on methodology, visit poetsandquantsforundergrads.com.